Over the following weeks, I plan on reviewing some of the movies that were nominated for Best Picture at the 2011 Academy Awards. I won passes to the Best Picture showcase hosted by AMC Theaters. This meant that for 24 hours straight, ALL TEN of the Best Picture nominees were played back to back, from 10 am Saturday to about 9 am Sunday. It was totally awesome. We got gift cards for concessions and people were there with blankets and pillows. One of the best experiences of my life and I hope to do it again next year. I only stayed for 6 out of the 10 because 1) it was getting late and 2) I had already seen 3 out of the 4 remaining movies. I only have not seen Black Swan. This also marked the FOURTH time that I saw Toy Story 3 in theaters, a feat that no other movie I have seen in theaters has even come close. And it was just as good/sad/funny/moving as the first time I saw it (yes I bawled like a baby). I have to say that this year, the nominations were all extremely well deserved and the range was wonderful. I had been hearing about this movie for some time. Why? Because of the "scene". You know, the one where he cuts off his arm. Because it was really gory and apparently made people pass out or vomit in the theaters. But before we get to that, let's back up and start with the inspiration for this movie. In case you were under a rock (har har), Aron Ralston was a mountain climber/hiker who went out hiking in Utah by himself where he got his hand trapped under a bolder. He was unable to free it and was eventually forced to amputate his arm by himself with a pocket knife. James Franco is absolutely brilliant in this movie. The movie is all him. Like 95% of the movie is JUST him. And it's a good thing that he is wonderful because the camera is on him all the time. 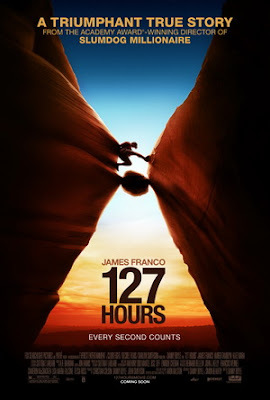 I love how I stopped realizing that it was James Franco and I saw him as Aron Ralston. When the boulder falls on his arm, it's one of those "AW CRAP" moments and "what the heck am I going to do now?" I was thinking while watching that when we get our hands or legs stuck in something, most of the time we know it's going to be ok, but someone is going to be there to help us. In Aron's situation, there is no one. And he realizes it and knows it's because it's his own fault. If Colin Firth hadn't been nominated for The King's Speech, I highly believe that Franco would have won the Oscar. Jesse Eisenberg and Jeff Bridges (haven't' seen Biutiful yet so don't know how Javier Bardem was) have nothing on Franco's performance in this movie. The scene where he does the "interview" with himself is very powerful as he realizes that he made a huge mistake of not telling people where he was going. When he comes to the conclusion that he did it because he likes being the hero, it's very moving because you can see that he finally realizes that it's ok to be weak and rely on others. The scenes where he can't get himself to shout for help were done very well. Ok you were wondering about "the scene"? Well I didn't see it. I had my hand covering my eyes and I didn't look at the screen except for one glance and it was very red so I looked back down again. Actually though the worse part for me was when he broke his arm. I HATE hearing bones break in movies and I didn't know that part was coming so it caught me off guard horribly. Even now thinking about that sound makes me gag. However the scene is only a few minutes long and don't worry you have plenty of time to get ready for it. You know it's going to happen, it's just a matter of when. Warning he does have to drink his own urine. While watching I felt incredibly guilty drinking my large soda as I watched Aron try to ration his water. It's a movie that you feel very connected to and it's emotionally moving. I didn't shed any tears but I was really touched by this movie. It's not for everyone. As I said, the camera is on Franco and just Franco about 95% of the time. Except for a moments when he drifts in and out of consciousness and thinks about his family and missed opportunities, the focus of the movie is him in that crevice and his arm under the boulder. We are there to witness his pain, his agony, his catharsis and his triumph. If you think you can stomach it, I highly recommend watching this movie. Don't judge James Franco by his Oscar hosting gig. This guy can really act and this movie perfectly showcases it. It's a well deserved nomination and I have a feeling that there will be more from him in the future. Although I've heard of this movie, I didn't actually know very much about it. (I've only heard the title.) So I appreciated reading your thoughts. Only I can't fathom why we have to make scenes so gory that it makes people throw up in the theater. That seems a bit of an unnecessary stretch.